Disclosure- This is a sponsored post. I was given a $25 Smoothie King gift card to try out their new smoothies. All views and opinions are my own. 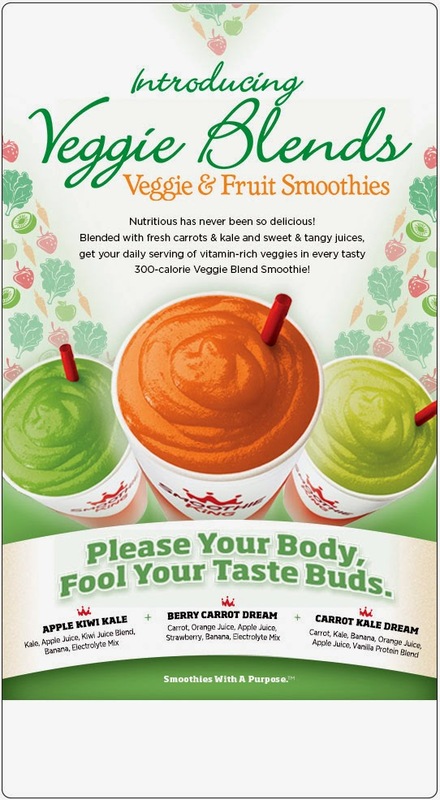 On March 17th, Smoothie King expanded their product line by introducing three Veggie Blends smoothies on a national level so that all stores would be able to offer even healthier options for customers. Their popular veggie blend smoothie flavors are Apple Kiwi Kale, Berry Carrot Dream and Carrot Kale Dream. My daughters and I had a chance to stop at our local Smoothie King to try out one of their latest smoothies. We all together decided to try out Apple Kiwi Kale because at home we use apples and kale a lot with our juicer. The taste is sweet like fruits but without the veggie taste. I really enjoyed it! My daughters really enjoyed their smoothies as well and that says a lot because they're pretty hard to please! I'm happy that Smoothie King came out with smoothies to help people get the necessary fruits and vegetables in their diets. Also it's prefect for mom's with picky eater kids to help them get their servings of fruits and vegetables. Adults can drink these nutritious smoothies as a meal replacement. I can't wait to return back and try out Smoothie King's other veggie blends flavor! Smoothie King's Facebook and Twitter Fans has a chance to win one of three inspiring prizes: Trek Bike, Nike Fuel Brand, and Nike Gift Card. Fans will first need to like Smoothie King page. Then just need to comment on their Veggie Blends promotional image, and mention three friends you think need a more delicious way to get their veggies. Followers first need to follow @SmoothieKing and then just Retweet their Veggie Blends promotional image and mention three friends you think need a more delicious way to get their veggies. I'm also hosting a giveaway for 5 lucky winners to win $10 Smoothie King gift cards. Make sure to enter now because it ends on 4/6. Which flavor would you like to try? Apple Kiwi Kale, Berry Carrot Dream, or Carrot Kale Dream? 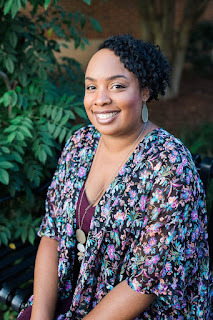 Disclosure- The sponsor is responsible for the fulfillment of giving the winners their prizes, not the blogger who is hosting. You must be 18 or older and live in the US to enter. Have a Happy Tuesday, Louida!! HeHe! My posts seems to be about food lately. I love food! Enjoy your smoothie Courtney! Happy Tuesday to you as well! I have to try them all! Thanks for sharing I have been making my own smoothies so I haven't been to smoothie king in a while but I really like their smoothies. My daughters and I will be going back to try the others. I'm like you, I've been juicing at home so it's been awhile since I visited my local Smoothie King until I heard they have fruits and veggie smoothies. I'm glad they're going towards a more healthier route! I never heard of the Veggie Smoothies until I walked into a location today. There's one downstairs from my job and I decided to visit an SK for the first time in close to two years. I ended up getting a strawberry Lean1 meal replacement, but I may try the Apple Kiwi next week! I never heard of Lean1 meal replacement with them. I'm so out of the loop with what drinks Smoothie King's has. I honestly have no idea! I have not been in Smoothie King in awhile but your review makes me want to go in. I am more of a fruit girl so I am thinking the Apple Kiwi Kale might be the one I try first! I think you'll enjoy the Apple Kiwi Kale smoothie since you don't taste the kale at all. I can't wait to try that flavor. I'm starting to really like carrots. I would try the Carrot Berry Dream! Oh my gosh, I think I have to go with the carrot berry dream too! Yum! Looks like I'll need to try Carrot Berry Dream next! Saw an insert in the paper for these and wondered how they are. I have a hard time getting my teen to eat veggies. We may need to try them. Apple kiwi kale is my favorite! Carrot kale dream sounds like a delicious blend to me. I would like to try that. I'm curious, what was the sugar content?